Before casting on for the sweater I’m knitting, I knit a gauge swatch. 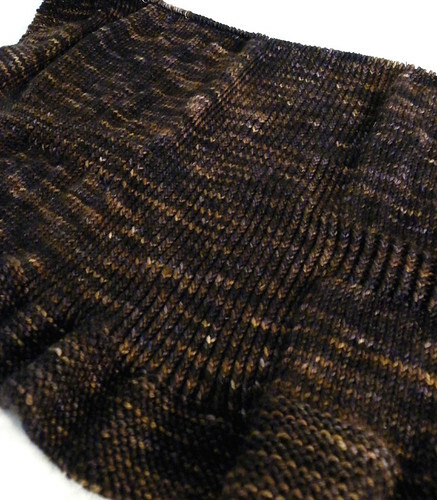 A good gauge swatch, with a one inch garter border on each side, and five inches of stockinette in the center. And when I wasn’t happy with the material it produced, I ripped it out, made a couple changes, and knit it all over again. Then I promptly cast on two sizes too small for me. I’ve always been on the heavier side. From high school until a few years ago my weight hovered around 180, and then I met my husband. My bad habits plus his bad habits plus the comfort level you seem to reach when you’re in a long term relationship all equaled a lot of weight gain. This summer I decided to do something about it and made an appointment to see a personal trainer. On the first day I weighed 254 lbs. It’s been just over two months since then, and I’m down 32 lbs. I’m going to say that again because I’m so darn excited about it. I’ve lost 32 lbs in two months. As you would expect, I watch what I eat like crazy, but one thing I didn’t expect is that I don’t mind it. I haven’t once strayed from my diet and eaten something I shouldn’t, and truthfully I haven’t even been tempted. I like what I’m eating. The hardest part happened about 2-3 weeks in when I started going through sugar withdrawals, which manifested itself in crankiness and depression. But that went away in about a week, and it was worth it because even though I have a lot more to lose, I already have more energy and feel better about myself. I see my trainer twice a week for strength training. At first I felt so out of place at the gym that I would almost have panic attacks, but now I feel comfortable there. My trainer and I couldn’t be more different (dude CAGE FIGHTS. FOR FUN. ), but his confidence in me and my abilities has meant a lot. And, like I said in my last post, I’m walking on my treadmill six days a week, plus I’m thinking about starting yoga. I did not intend on having this conversation with you. But at this point my life has changed so much that it’s not something I felt like I could keep to myself. So, back to the sweater. It’s Amelia, using Madelintosh Worsted in Fig. It doesn’t fit me yet. But it will. Way to go! The prospect of having to get a whole new wardrobe is a big motivator for me to stay the same size for as long as possible – so maybe once you’ve reached your goal your sweater will keep motivating you to keep the weight off. 🙂 My partner & I are thinking of joining a gym this year during the winter months when it’s just not fun going jogging outside in Portland. Good for you! Eating well and exercising is the best thing anyone can do to stay healthy—keep it up! I hope your husband has joined you?! Yay you! That’s *awesome. * Keep it up! And that is going to be one beautiful sweater! Dad and I are very proud of you – well we always have been! This is a life changing decision and they are always difficult to come face to face with. We have worried about your health as there is a lot of diabetes in our family and being overweight can be a cause. What we want is for you to be healthy and happy! This is a big deal because it takes dedication and opening that door to understanding. You are learning about food and what it can and can’t do for you. I guess it is the – eat to live not live to eat attitude. We love you and think you are really somethin! a very inspiring post. well written and good-intentioned. thank you for sharing. really. love it! That is so amazing, and what a gorgeous sweater color! I bet you can’t wait. Congratulations, Kate! Keep it up and that gorgeous sweater will fit in no time at all! Wow, talk about life changing habits and decisions. Good for you! I am looking forward to the Amelia photoshoot – I have no doubt in your ability and drive to make it happen. Pat yourself on the back, Kate! I love my trainer. Just thinking that she /might/ be disappointed if I don’t go to the gym is enough to get me there. Congratulations! If you feel good, strong and in control well then- the world is yours! When you feel good then you are unstoppable and that is a good thing! Can’t wait to see your new sweater! Hi Em, Oh my gosh, I am so very proud of you!!! There is not much that takes more courage or determination! It’s such a big step to make a huge life change. How is Nathan with it? Do you have to cook special for him? As I’m sitting here now munching on leftover Halloween candy, I’m ashamed of myself! You’re my inspiration! Way to go, Em. Oh my gosh, that’s amazing! You’ve been keeping this a secret and should have shared it sooner. I’m so excited for you and I’m sending encouragement your way to keep going. I can’t wait to see your sweater done, it’s such a pretty color. Great job – you are an inspiration!!! i have now been dairy, meat and sugar free for just over 6 months and it feels SO good – not just the physical, but being in control over my addictions!!! Keep up the good work and save those addictions for YARN not snacks!!!! You go girl! I’m also trying to drop some lbs before a trip soon to somewhere warm (!) 🙂 And Multnomah will be my travel knitting for that trip!